The Bungalow Bird House is designed for use by a large variety of backyard birds including Wren, Chickadee, Swallow, Nuthatch, Downy Woodpecker, Finch. 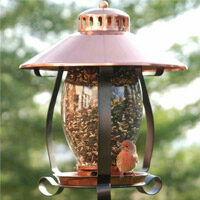 Mount on a tree or post and provide a safe home for your birds. Available in Gray. Resilient pine shingles top the roof.